Kuk Early Agricultural Site covers 116ha of swamp land that has been systematically cultivated since 7,000 and possibly 10,000 years ago. This makes it the earliest evidence for the domestication of plants in Oceania. Crops grown include taro, yam and bananas. Stone tools were found, as well as ditches and drainage channels. The traditional agricultural practice continued until the 1930s when Europeans arrived in the region. In July 2016, I spent a few days in Mount Hagen, where I stayed at the Highlander Hotel. (link). 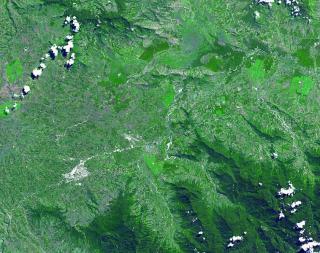 Mount Hagen is a short drive from the Kuk Early Agricultural Site, Papua New Guinea's only World Heritage Site, which demonstrates a technological leap that transformed plant exploitation to agriculture around 7,000 to 6,400 years ago, based on vegetative propagation of bananas, taro and yam. Kuk, however, is probably only interesting to agricultural historians and wasn't that interesting to a more casual visitor; in fact, the core area, at least to me, was indistinguishable from the buffer zone, which looked similar to most of the agricultural areas surrounding Mount Hagen. Prospective visitors should contact Nicholas Namba (email: nnamba77 (at) gmail.com), who acts in some type of official capacity and has lived at the site since the early Australian excavations; he's very familiar with the site and was, in fact, the first guide that I've had at any WHS to point out the core area as distinct from the buffer zone. It would be difficult, if not impossible, to rely on the WHS map to identify the core area, so a visitor should seek guidance from Mr. Namba. Perhaps the most surprising thing about my visit to Kuk was that the weather app on my iPhone recognized that I was at Kuk Agricultural Site. Papau New Guinea is best known for its avifauna, so my main objective was to see at least one species of bird-of-paradise in the wild. I went bird watching at Kumul Lodge, which is located at high altitude about an hour from Mount Hagen. During my afternoon at Kumul, I saw two birds-of-paradise, a male ribbon-tailed astrapia, one of the iconic, flamboyant birds-of-paradise, and a female brown sicklebill, which is more restrained. I also visited two markets in Mount Hagen, the central market, which is largely devoted to agricultural products, and the betel nut market, which is on the road to Kumul Lodge but is not as frequently visited. Deep in the betel nut market you can find the vendors selling marijuana, which they refer to as PNG gold; contrary to my expectations, the marijuana vendors were not reserved and actively sought to be photographed. I arranged my flights so that I would not have to overnight in Port Moresby, the very uninteresting capital of one of the most interesting countries, but I did coordinate to allow for a several hour stopover. During my time in Port Moresby, I visited Adventure Park PNG, which is more of an aviary and zoo than amusement park. The aviary displays 11 of the 42 species of bird-of-paradise, including Raggiana bird-of-paradise, the national bird of Papua New Guinea, and the zoo displays several species of tree kangaroo, the country's iconic mammal. I made all of my arrangements with Aaron Hayes at Ecotourism Melanesia. PNG was the 164th country that I have visited and was, by far, the most expensive for independent travel. The value-to-cost ratio of my visit to Kuk was probably the lowest of any of the WHS that I have visited, but, it was worth the high price to visit other parts of PNG. In 1977, it was my great good fortune to be part of professor Jack Golson's multi-disciplinary team during the field season at Kuk Station. My husband, Art Rohn (North American anthropologist/prehistorian) and myself (cartographer) were visiting Australia for a year's sabbatical where we became friends with Jack Golson and faculty members at Australia National University and Sydney University. I left cartography and archaeology years ago to pursue other interests. But Kuk left such an indelible stamp on me that for years I searched the Internet for mentions of the site. There were only a few papers on Kuk, one citing our work there. However, since Kuk's inclusion as a World Heritage Site in 2008, all manner of Kuk publications abound. Kuk remains one of the most happy and vibrant memories in a life thus far liberally sprinkled with adventure. Imagine how exciting it was for a young woman of 34 to contribute to what would become one of the most important continuously cultivated agrarian sites in the world. I remember vividly how my husband at the time, Art Rohn, offered his vast expertise to help interpret what Kuk was all about. The excavations, of course, were paramount to this multi-disciplinary interpretation. At first I used the previous mapping techniques, increasingly aware of their inability to represent sometimes amorphous features without diffinitive boundaries. One evening we sat around the dinner table, in one of the 2 stilt houses we called camp, hashing over better ways to map the mounds and valleys which were part of the intricate gardening system. I believe (though time may have dulled my memory) that it was in fact I who suggested we use a rather primitive mapping instrument called a "leaf alidade", a very simple brass siting device, to fashion a series of contour maps. All agreed this was a good idea and so Jack sent for such an instrument, delivered by the next visitor from ANU. I would go out daily with my helper, one of the indigenous highlanders perhaps all of five feet tall, before the rains came to drive us back to camp. I stood at the map table sighting a string attached to a plumbob which Ku held over the features. I drew a line and then extended a tape to measure distance, marking each with a dot on the map. Height was determined by sighting a measuring rod. From the field maps with thousands of points and elevations, Art looked over the actual features, turned to the map and connect the dots of similar elevation. At the end of the season (10-12 weeks?) we had some 15-20? field maps, most with a contour interval of 2cm. Yes, 2cm. I received permission to keep copies of some of the originals which are still in my possession. It is these maps which appear in Jack Golson's original monograph and several subsequent publications. I believe they capture the essence of these features as well as could be done at the time, prior to sophisticated computer techniques now in practice. Experiencing Kuk, Mt. Hagan, the Upper Waghi Valley, with Mt. Okka an active volcano looming in the distance, was like being part of a National Geographic special. The natives were so startled by my fair hair and light skin, I felt like the Queen of England! I loved one occasion when I was entrusted with driving our native workers home in our Land Rover. They sang and chewed beetlenut the entire way, perched on the bonnet and running boards. Even the acrid smell of their sweat seemed like perfume to this romantic American. One day on the dig Jack was approached by a Big Man (tribal leader) who told Jack that the native workers would not be able to work the next morning on account of the fact that they had to avenge a sorcery killing of one of their pigs. All turned out well. No one was hurt when the local constabulary broke things up and the workers returned to the dig that afternoon. But Payback was regularly practiced as was Bride Price Exchange. Keener is PNG currency based on shells of the same name. But a bloke could still sell a couple of pigs to buy a ticket and fly to Port Moresby. Only wish I could post some of the photos from my time at Kuk and in the Western Highlands taken by Ed Harris, a member of our team, and Paul Goretski(sp? )a visiting student from Sydney University. I remain most grateful to Jack Golson and others who made my experience possible. If Kuk does get inscribed in 2008 it will be another case of a “near miss” for us I am afraid! We may well have flown over it when we took a light plane along the Waghi valley from Goroka to Mt Hagen (the site is a short distance NE of Mt Hagen airfield) but I wouldn’t claim that as “seen”! However, I wonder if it is really “seeable” by anyone other than archaeologists connected with the government or university research. But we did achieve some “connection” with the site as we visited the JK McCarthy Museum in Goroka (This is the main "Highland Museum"). Its exterior is painted with a mural (Photo) depicting the early agriculturalists of the area (described in the museum as the “world’s first gardeners” or similar words! PNG is clearly, and rightly, proud of this historical development by its peoples). A section of the museum was devoted to the discovery at Kuk Swamp (which is situated further west near the town of Mt Hagen) of the remains of these early agricultural practices. Excavations have identified plant residues, stone implements and indications of ditch/mound building which show that, as long ago as 10000 years BP, there had been “agriculture” in the area based initially on taro and then, around 6500 years BP, involving bananas, sugar cane and yams. The dates are very significant because they indicate that these people in the Highlands of PNG were not recipients of the knowledge and skills for sedentary agricultural practices but must have developed them independently. At the museum I was able to have an interesting conversation with one of the curators about the problems for a country like PNG in gaining inscription for one of its sites. They were getting help from ICOMOS but, what I call the “managerially based, Western oriented”, approach set out by UNESCO/ICOMOS for assessing sites had clearly caused many problems to PNG where such concepts are not well established and, in some cases, are not acceptable to the country’s culture. Land ownership and use was clearly a major problem – you only have to spend a few days in the highlands of PNG to realise just how important this is as a cultural issue. Even our progress around the area was impacted by several land-based disputes which prevented us from travelling as planned (though we did still visit a traditional village in the countryside outside Mt Hagen) and, on one occasion involved us requiring police protection – not for anything we had done but because of a dispute between the hotel we were staying at and the traditional “owners” of the land on which it was built. Three of our guides during the trip had family members or friends who had been involved in arson and even “murder” arising from Clan disputes – you got the impression that it was just a “way of life”. One guide said he would have to try to kill the driver with whom he was friends but who came from another clan if matters between the clans ever came to that! (A fascinating aspect of visiting tribal PNG is the way it makes one examine the assumptions of one's own society. Were the guide's "beliefs" on this matter much different from those of soldiers in the army of a "Nation State" who will kill for their country?). The Central Government and its western-based law system is often not brought into such matters which are solved instead in traditional ways with “Payback”. You can imagine the problems when, into this cultural milieu, are dropped Western heritage conservation concepts such as “buffer zones” and “management plans”! The local Kawelka people are not going to take kindly to being told what (and what not) to do with their land. I understand that a Research Station was closed down in the early 90s and the excavations covered over. The locals then moved in and there is concern about destruction of the historical remains. If you are interested you can get an idea of some of the issues and how the PNG government and UNESCO are handling them by searching for “Kuk” within this document from a 2007 UNITAR workshop on the "Management and Conservation of WHS"
It would be interesting to get a post on this site from an archaeologist who was involved in the excavations and/or the preparation of the inscription documentation – is it possible to visit the site (and under what conditions)? Is there anything to see? Are there any plans for improving visitor access? Etc, Etc. Or does this join the list of sites (see my review of the Omo Valley) which are archaeologically significant but where there is nothing to see!! 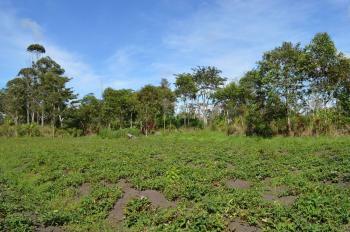 Tea: The site has been used for growing tea. AB review In "the late 1960s ... the landscape was drained and converted into a tea plantation"